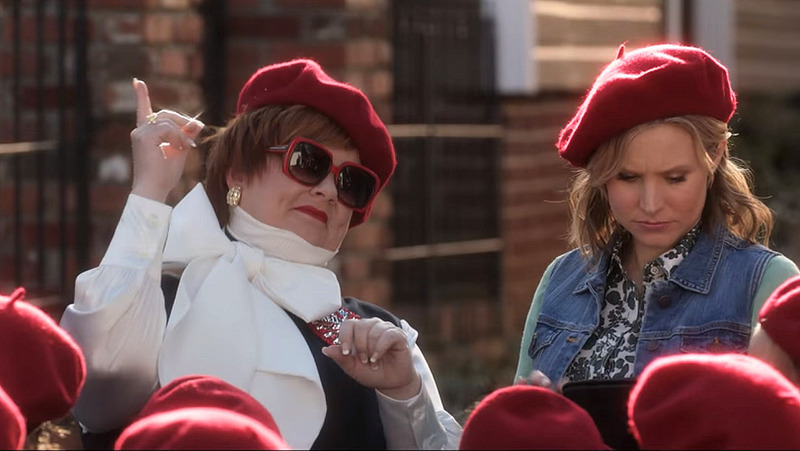 Melissa McCarthy is one funny lady, so it’s really hard to straight-up hate on this movie. Let me be clear: “The Boss” is not a great comedy. On the McCarthy comedy barometer, it’s far better than the abysmal “Identity Thief,” it’s miles ahead of the awful “Tammy,” but it’s not quite as good as “Bridesmaids” or “Spy.” There’s some genuinely funny stuff in the middle of the movie, but the film’s really unamusing start put me in a negative mindset from the get-go. Some of the supposed comedic situations are far from funny, especially in the movie’s first 15 minutes. The first quarter of the movie feels like it’s full of excessive lame gags, all desperate attempts to elicit laughs (yeah, it’s BAD). The humor isn’t mean spirited or gross, it’s just not funny (Peter Dinklage gives a real head scratcher of a performance as a business rival who thinks he’s a ninja). Many jokes land with the loudest thuds you’ve ever seen. Thankfully McCarthy doesn’t resort to the most odious ‘fatty fall down’ antics as she has in the past (perhaps she and her director husband Ben Falcone are finally realizing that she’s far better than that). Yes, there are silly pratfalls and lots of jokes fall completely flat, but there’s a pinch of heart and some genuine laughs sprinkled throughout. When super wealthy Michelle Darnell (McCarthy) gets busted for insider trading, she winds up in jail. When finally released 5 months later, she finds all of her possessions are repossessed, her business closed, her house foreclosed upon, and her formerly loyal employees have jumped ship. With nowhere to go, she heads to former assistant Claire’s (Kristen Bell) tiny apartment and moves in. Just when you think the story is going to turn into the same-old same-old fish out of water story, the movie surprises with a fun plot about Michelle starting her own brownie business with the help of a local cookie selling Dandelion Girls troop. Things swiftly pick up as soon as the ruthless Michelle is released from jail, much to the credit of the great comedic chemistry between the two lead actresses. This movie didn’t disappoint me because I went in with the lowest of low expectations. I exited the theater pleasantly surprised. I found myself enjoying this movie much more than I expected to when it started, and eventually it won me over. I can’t completely forgive the awfulness of the first act, but any movie that can redeem itself after falling so far behind is one that I can feel comfortable (mildly) recommending. “The Boss” is a decent Friday night movie: the type of movie that you can confidently pick up from Redbox and watch while you’re eating pizza and drinking a nice glass of wine. It delivers some solid laughs with some jokes that are both intelligent and inspired that will go great with the pie and juice, but you’ll forget them before the pizza box even makes it into the trash bin. There just isn’t much meat on these bones. The story is enjoyable enough but far from being inspired; the characters likeable enough but not the kind you care about ever seeing again. While it’s nice to see a female-driven comedy with strong women that’s not about the girl getting the guy, that fact alone doesn’t make the story a compelling one. That said, when I did laugh I laughed hard and I laughed well — which is sometimes all that we care about or ask for. And as she did in 2015’s “Spy,” Melissa McCarthy carries the movie quite well. Ever since seeing her in the 2014 movie “St. Vincent,” I have been a Melissa McCarthy fan — at least in the movies when she isn’t relegated to playing roles based on her body type. She is a talented actress, but that talent has been hard to notice when she’s relegated to movies like “Tammy” and “Identity Thief.” This movie isn’t like those latter movies, though. While there is some (unfunny) physical comedy in “The Boss,” it’s relatively fleeting and not mean-spirited. So go ahead — pick this one up from the Redbox on the way home, and pop it in while you enjoy your greasy delivery dinner. You’ll be perfectly satisfied. But if you’re looking for a good movie to watch during a night out at the theater, “The Boss” shouldn’t be at the top of your list. I am excited this isn’t a fatty fall down movie. Melissa’s talent is wasted in like Tammy. Thanks to your review, I will see Boss in the theater. It’s not a great comedy, but it’s enjoyable enough. The first 15 minutes are truly DREADFUL but if you can get through that, you’ll be rewarded with some good laughs. Thanks for the comment and please come back and let us know what you thought of the movie after you see it! I will definitely make a comment after seeing The Boss. I agreed with a lot of Louisa’s commentary about the movie. I was not happy with this The Boss at all. I would disagree that it’s even a great popcorn flick. I think Melissa McCarthey’s character gave the movie some merit, but when I stopped to think of how awful the rest of the comedy was, I couldn’t give it anything higher than a 3 out 10. Maybe I should go into these movies with low expectations too. Haha. I always go into every movie I see and start by giving them a 5 out of 10 and go up or down from there.